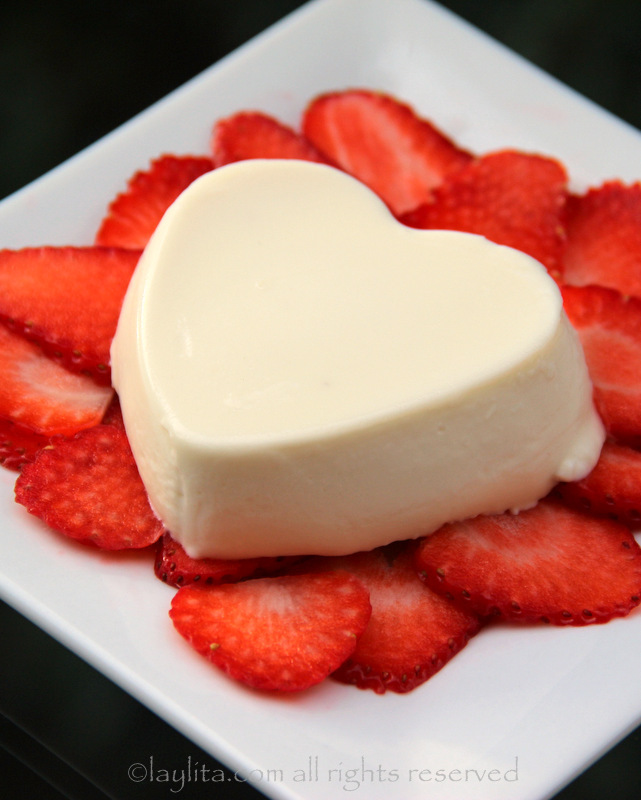 Panna cotta, literally translated as cooked cream, is a traditional Italian dessert that is made with cream, milk, sugar, vanilla and gelatin. 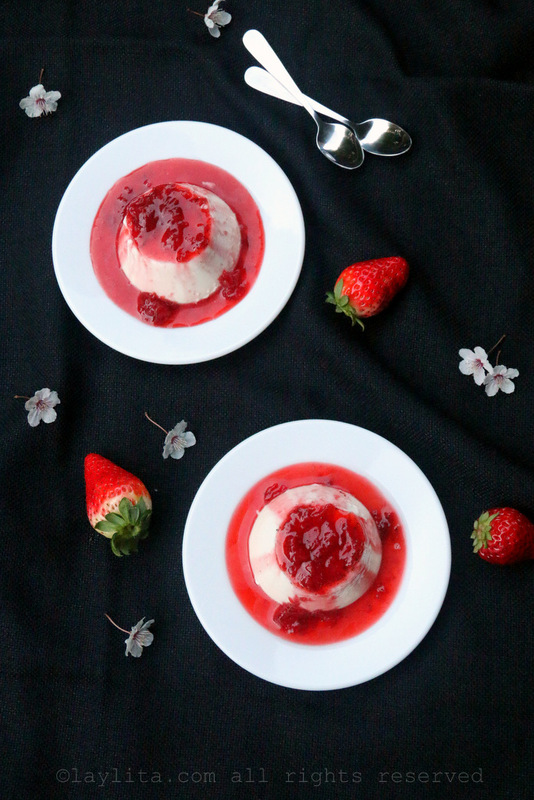 Panna cotta is one of my ideal desserts: it’s very easy and quick to make, it can be made ahead of time, and it is an overall crowd pleaser. 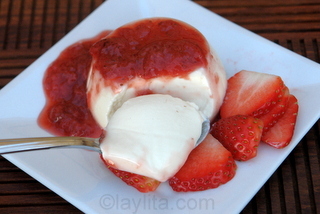 I learned how to make this panna cotta recipe thanks to my awesome friend Rossana. Anytime you see an Italian recipe posted here it is likely that it came from her. 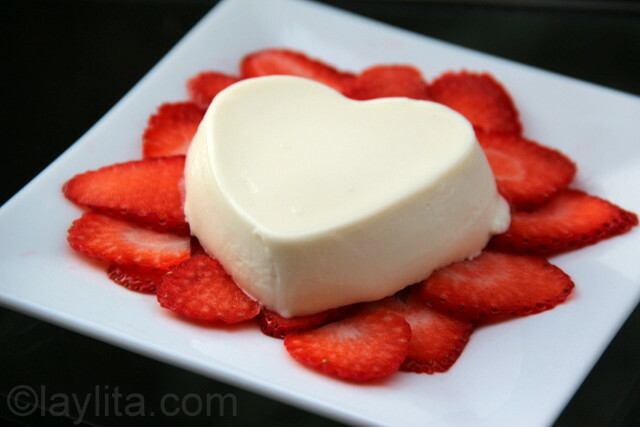 Panna cotta is a classic Italian dessert that is made with cream, milk, sugar, vanilla and gelatin. 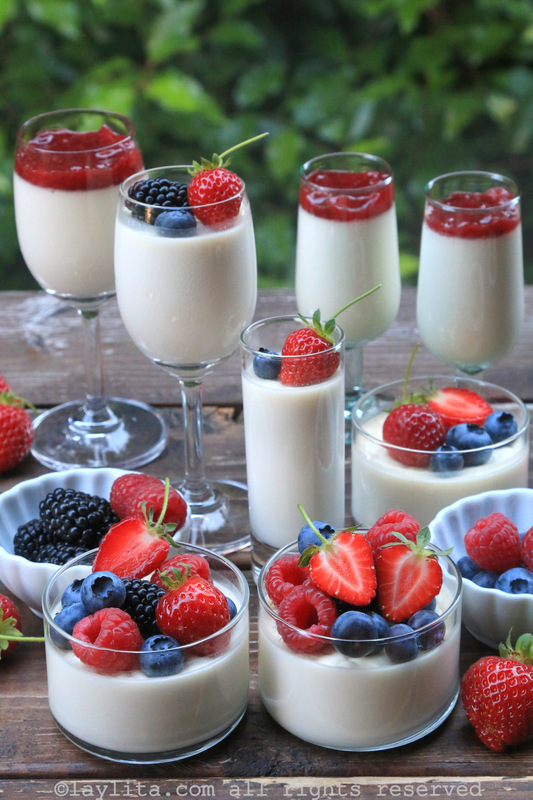 Top this easy recipe with fruit or sweet dessert sauces. 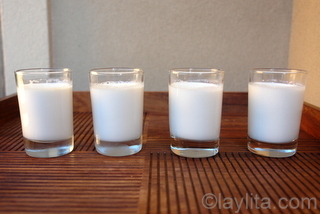 Put ½ cup of milk (25% milk volume) in a small bowl and pour the gelatin over it to let it soften. 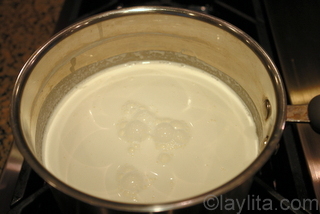 In a medium sized pot, heat the cream and the rest of milk (75% volume) with the sugar until the mix starts to boil. Gently stir in the softened gelatin mix and stir well. To make the panna cotta extra smooth you can pour the cream mix through a mesh strainer, this well help remove any clumps. 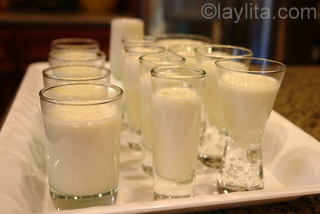 Pour the panna cotta mix into serving glasses or molds according to your preference. 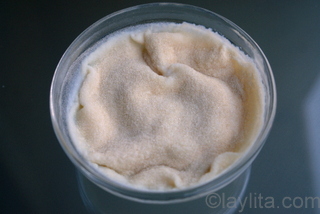 Let the mix cool down and then refrigerate for at least 4 hours before serving, overnight is ideal. Serve directly in the glasses or remove from molds. Garnish with your choice of fresh fruit, fruit sauce, dulce de leche or caramel, chocolate or just serve alone. Rossana would make this dessert for dinner parties, but usually just for the adults; she would have chocolate cake or ice cream for the kids. I started making this Italian dessert more frequently when Rossana moved away and I would also offer it to the kids, who loved it (of course), and were shocked when they learned that they had been deprived from it at Rossana’s parties. 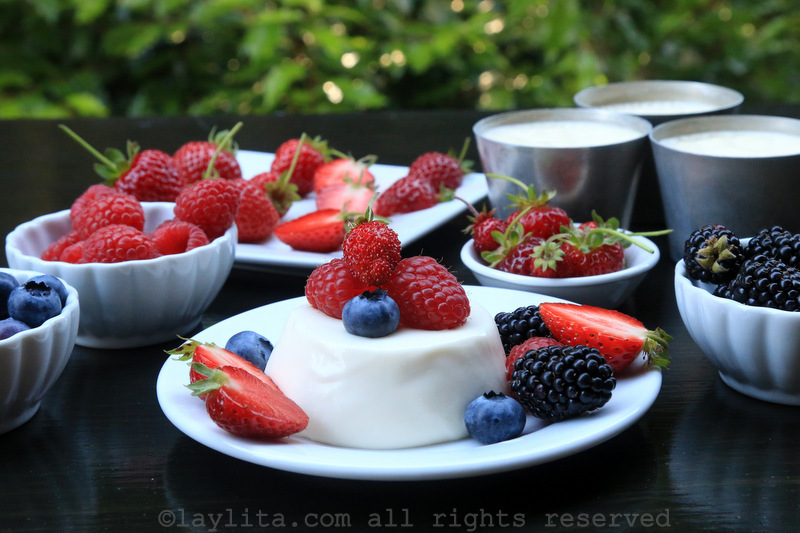 Classic panna cotta is made using vanilla, but you can also modify the recipe to make it with chocolate, coconut, or your flavor of choice. 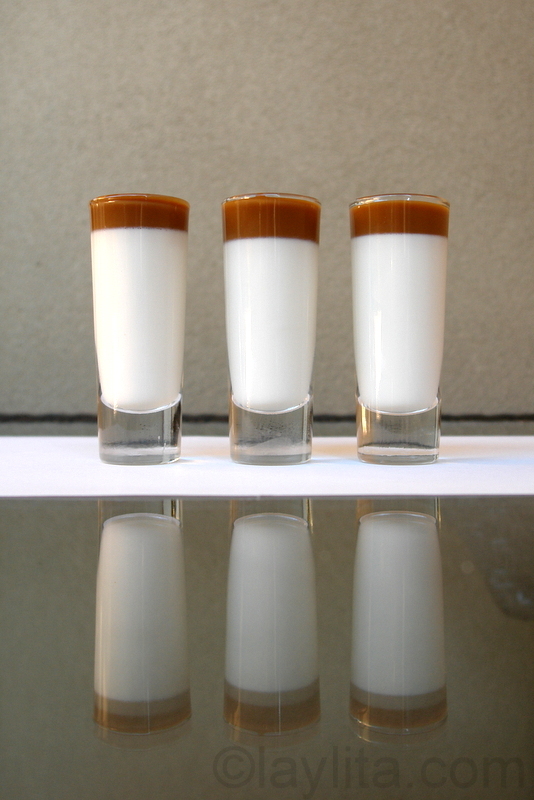 It can be served as is, or garnished with fresh fruit, fruit sauces, chocolate sauce, dulce de leche, etc. 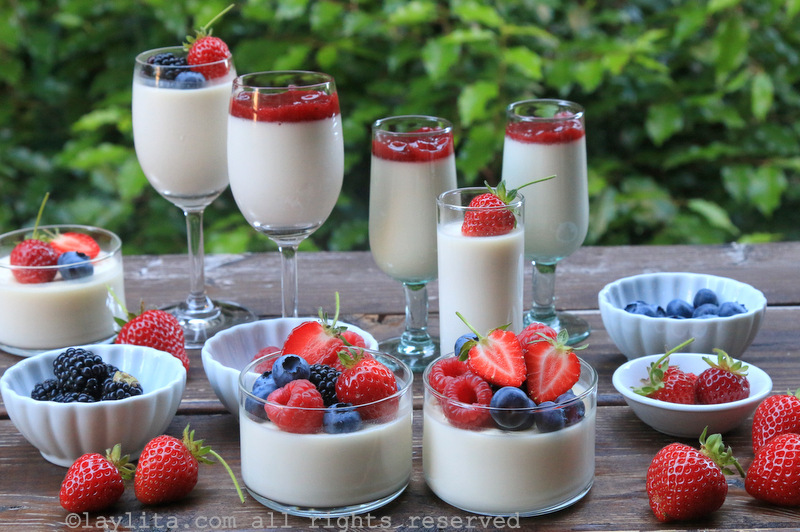 You can put the panna cotta in molds, ramekins or serving glasses. I like to use a variety of different sizes; this works great for parties as people can choose the size that they want. For special occasions, such as Valentine’s Day, you can also use molds that are shaped for that occasion. 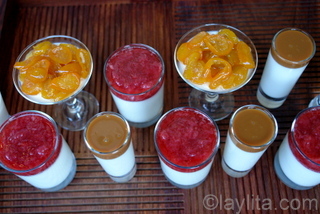 I also serve some plain and others with different toppings, such as a fresh strawberry slices, passion fruit pulp, homemade strawberry sauce, candied kumquats and dulce de leche. Tried it and my husband from Italy said it does taste authentic. Thanks! I made it with caramel topping and everyone loved it ! 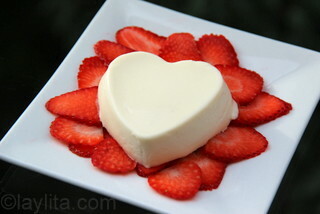 I thought it would be so hard to made a panna cotta I used to buy it but it was easy and delicious! Thank you !! ??? Hi there! Thanks for sharing this recipe. 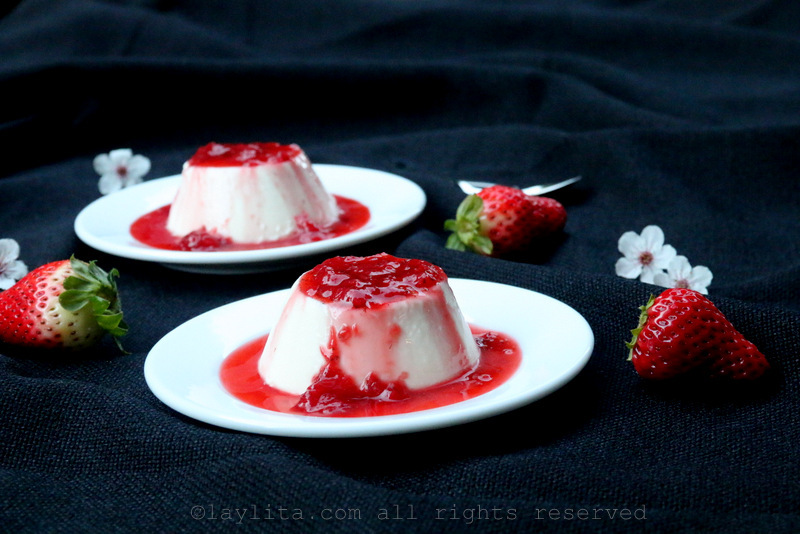 I love panna cotta but did not know how to make it until now. I will try it, thanks again! Cheers! 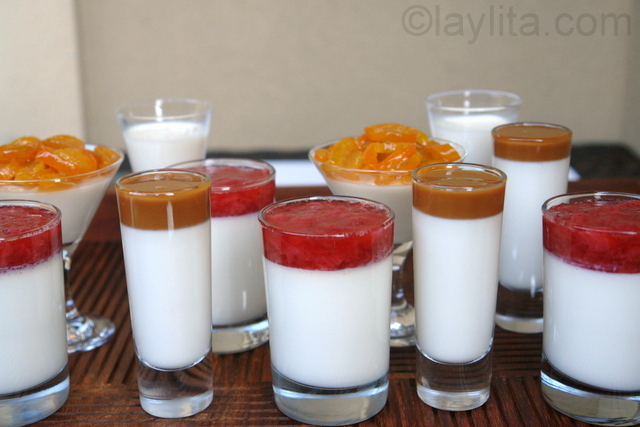 I love the glasses you did the dulce de leche panna cotta. What size are they? Do you remember where you found them? Thank you for this great recipe. 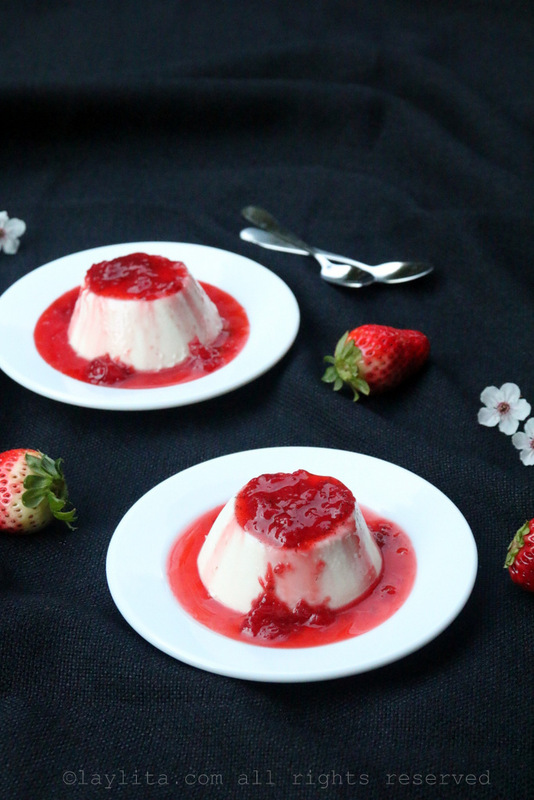 I thought that panna cotta would be much more difficult, but it was so easy! I made it for a small get together with friends that had an Italian theme. I topped it with fresh sliced strawberries. Everyone loved it! 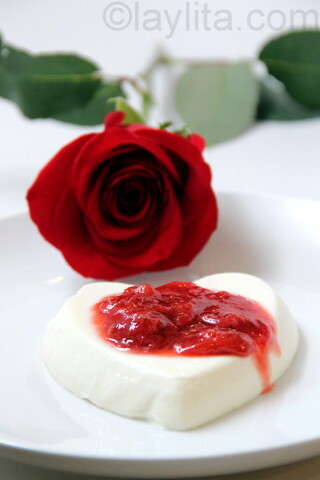 I just love cooking and your panna cotta is just great. Thanks for sharing it with us. 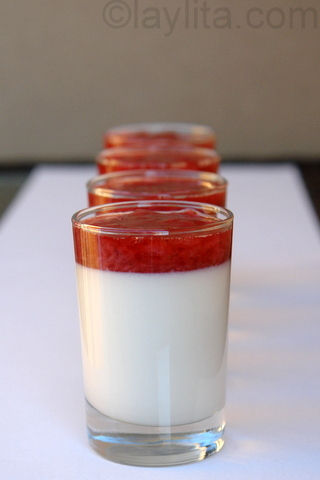 Loved the Panna Cotta– cooked Valentine’s dinner for my family, including ceviche de camaron with chifles, french onion soup, grilled lamb chops, bacon-wrapped asparagus and topped off by wonderful panna cotta with a strawberry-ginger ale topping (my wife’s favorite soda is Vernor’s ginger ale!). I’m definitely going to try the panna cotta again, maybe chocolate next time. Thanks for your great site. I was a missionary in Ecuador 30 years ago and I love keeping connected with the food and the culture through your site. 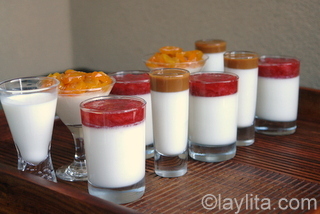 The pana cotta pic above looks like it’s topped with passion fruit. Do you have a recipe for the topping or is it just the pulp? Ps- just read your bio. I was picturing an abuelita ( maybe getting help from a web saavy grandchild!) but now that I see you’re prob about my age, I love your site even more! We are also a multinational family with a love of fusion in food, cultures & histories – and try to keep things healthier and more sustainable in our choices. It’s just plain passion fruit pulp. 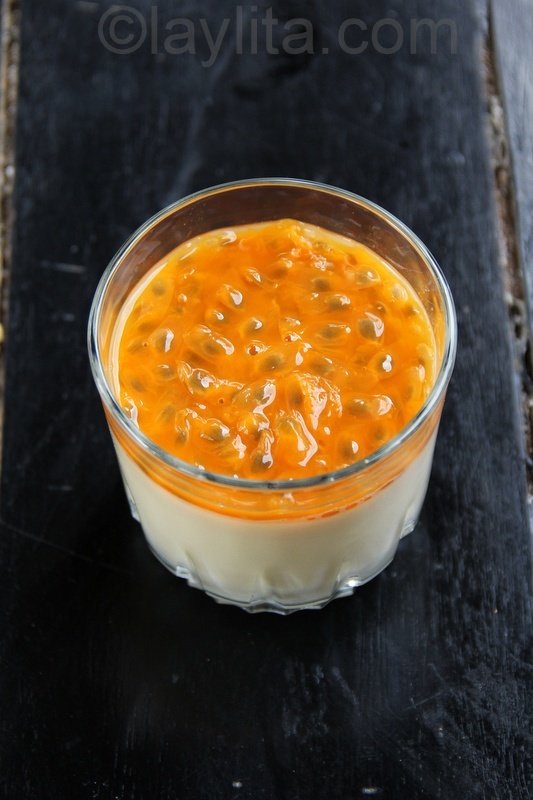 Though if you can’t find the fresh pulp you can mix the frozen concentrate or passion fruit juice with unflavored gelatin (and sugar/honey if the juice is unsweetened) and add it as a layer to the panna cotta – just wait for the panna cotta to set before adding it and then wait for the passion fruit layer to set.